There is a petition to hire back Keith Olbermann after his suspension by MSNBC for making undisclosed political contributions. The petition has over 250,000 signatures. Despite my total lack of sympathy with Keith Olbermann's political views, I want him to have the same freedom I would want for myself, and signed the petition that he should not have to utter an abject mea culpa. It should be common sense that journalists should disclose financial contributions and interests that would sway their journalistic impartiality. For a news reporter who purports to deliver "just the facts" this would be more pressing for viewers to know his hidden loyalty. But for those journalists and commentators who are overt and open in expressing their political preferences, it would seem almost superfluous to demand of them full and rigorous disclosures of political contributions. Keith Olbermann fits into that category. It does not take psychic abilities or great education to guess which type of candidates he supports. 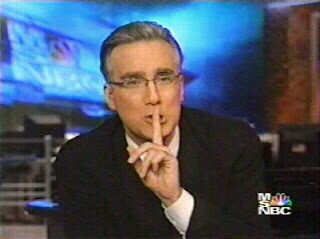 Keith Olbermann should be restored to his positition on free speech grounds. By firing him, MSNBC is making a hollow gesture of respect for impartiality that is convincing to no one. It is no sin to have a political bias. It is, however disgraceful to deny others this right. The major networks may have a political bias towards liberalism. Talk radio is inclined towards conservative views. And the blogosphere is truly a free for all. As a whole, a wide spectrum of views and persuasions is available to anyone who cares to seek them. Perhaps if we are honest with ourselves about the biases that exist in news coverage, we can move forward with a firm resolution to allowing a wide, open and frank exchange of opinions across all media outlets. Keith Olbermann's suspension does nothing to ameliorate media bias. It is a charade that should come to an end. Not to put too fine a point on it, but I’m going to take a contrarian position here. I’ll admit up front, I have no love for Olbermann, but I want to be convinced this was a firing offense. He committed no crime, and I seriously doubt he was the only MSNBC employee to pony up some loot for lefty candidates. Nobody with an IQ above 30 thinks Olbermann is either impartial or a journalist, so it’s not like his credibility was tarnished. He has none. His on-air advocacy for candidates provided far more assistance than a couple of grand quietly donated to their coffers. If MSNBC has a written “ethics” policy requiring approval for donations, and he violated it, and that policy is being universally enforced, then MSNBC is fine. If they want to fire him for having lousy ratings and being one of the most hated people in broadcast television, then as long as they’ll be honest about it, that’s fine too. But if MSNBC is using this as a convenient excuse to unload him, and they’re turning blind eyes to others doing the same, then I have a problem with it. If we are people who favor impartial justice, even for people we despise, then this is the stand we must take. It’s what distinguishes us from the people on his side, who base their judgments on a person’s ideology.